In this article I’m going to talk a bit about Square, Inc. (SQ) and its relationship to Bitcoin. I will be evaluating the legitimacy of their foray into the blockchain world. This sort of evaluation is important; unfortunately, there are many questionable or outright fraudulent companies which are trying to ride the hype surrounding cryptocurrency. It goes without saying that I don’t think it’s a good idea to invest in a company that gets into crypto just to increase its share price! However, before going into the details of SQ I’d be remiss if I didn’t mention the biggest personality involved with the company. The man pictured at the top of this article is none other than Jack Dorsey, CEO of Square, Inc. and — as you probably know — Twitter. One cannot easily divorce a company’s CEO from the company, especially when that man has become — or tried to become — a cult of personality. Think of Tesla, for example, without thinking of Elon Musk. You can’t. Thus, it will be fruitful to talk a bit about some recent events with Twitter and how they impact my thoughts on Jack Dorsey’s other company. Anyone who follows my work knows that I am something of a free speech maximalist — in fact, this is part of what got me into Bitcoin in the first place. My support for free speech automatically puts me at odds with many of the Silicon Valley types. I often and loudly talk about how various companies such as Facebook, Google, and Twitter wield a monstrous amount of power in the modern world. These corporations are effectively able to determine what much of Western civilization ends up consuming on the internet, as well as what people can say. This kind of power probably shouldn’t be wielded by anyone, but it especially shouldn’t be wielded by private, mostly-unaccountable entities. When you start considering some of their past slogans — Google’s “don’t be evil,” Twitter’s “free speech wing of the free speech party,” etc. — you almost have to wonder if you’re living in opposite land or perhaps an Orwell novel. Because Jack Dorsey is the CEO of Twitter I am immediately skeptical of him. It shocked me that he recently ended up on the saner side of the coordinated Alex Jones censorship debacle, especially considering Twitter’s abysmal track record on censorship of its users. An article on Gizmodo suggested that Jack himself might have interceded in this case. Could it be that he actually has some respect for free speech? Well, I doubt it — but I’ll get into that more later. Edit: The very day I published this article, Twitter reversed itself and permanently banned Jones from the platform. Sadly, my skepticism is vindicated. Wikipedia describes Square, Inc. as “a financial services, merchant services aggregator, and mobile payment company based in San Francisco, California.” Jack Dorsey, as I’ve mentioned, is also the CEO of this company. It — and he — have become poster boys for Bitcoin to a degree, although this degree is probably quite a lot smaller than Jack would like. Even if you’ve never heard of Square, Inc., you’ve probably interacted with some of their products without even knowing it. Presumably the company was named after its main products — square-shaped credit card-reader peripherals which attach to phones and allow people to process transactions. Almost every coffee shop I go into these days uses Square or a similar product rather than a traditional card reader. It’s not so much that I think this is impossible or that I don’t like the idea. I’m a Bitcoin enthusiast, after all! It just seems like a pretty extreme thing for a CEO to say — on par with Elon Musk talking about Martian governments and whatnot. Here’s where I’m going to indulge myself and play armchair internet psychiatrist. I think Jack desperately wants to be remembered as a visionary. He wants to be a Bill Gates, a Steve Jobs, or at least an Elon Musk. I think it deeply bothers him that he’s not going to be remembered in this way. It’s sort of ironic because — whether people realize it or not — he’s one of the most powerful men in the world. In spite of this this, nobody seems to really care much about him. Is Jack Dorsey even a household name? Probably not. 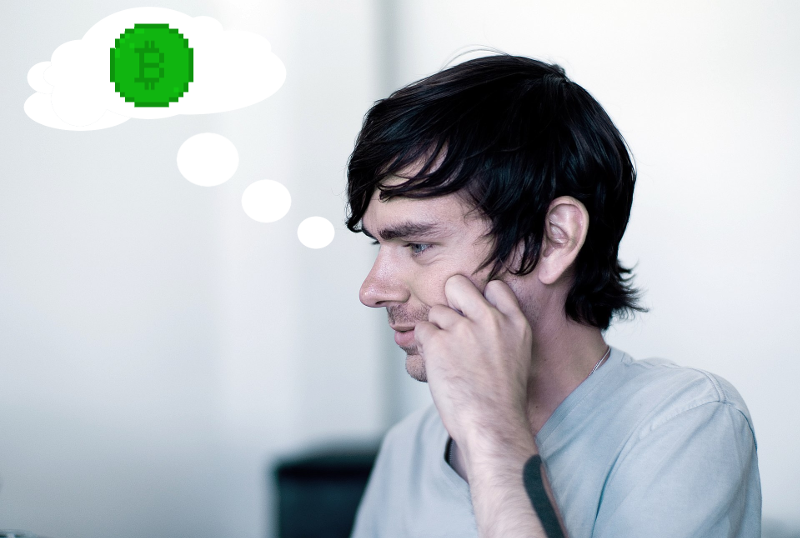 Ultimately, I’m not convinced Jack Dorsey is particularly genuine about his enthusiasm for Bitcoin. I think that by attaching his name and his company’s name to the cryptocurrency, he intends to more-or-less coattail ride his way to a loftier place in history. Unlike most men he has the resources to stake a claim on the industry and maybe even make a difference. What is Square doing with Bitcoin? Whenever I’m looking at a “blockchain company,” I try to get an idea of how well the company acts as an analogue for the price of Bitcoin. I first talked about why someone might want to invest in such a thing — rather than just buying some bitcoins — in my Riot article. I won’t rehash all that here — instead I’m going to talk about what Square is actually doing with Bitcoin and whether or not I think it’s a solid company to invest in. Cash App — formerly known as Square Cash — is a mobile payment service which is very simple to use. Until recently this wasn’t much more than a clone of PayPal — and as much as I don’t trust PayPal and its draconian methods, I might trust Jack Dorsey even less. However, in January of 2018, they expanded their services to include Bitcoin trading. Now that’s a good way to pique my interest! Buy and sell Bitcoin. At the time of this writing, Cash App supports buying and selling Bitcoin in all states except Georgia, Wyoming, and Hawaii. Anyone who successfully navigates the complex legalities of acting as a Bitcoin exchange is bound to make some money. They claim that they do not tack on a percentage or fixed fee onto these transactions — if this is true, it begs the question of how they’re going to make any money off of it. A few months ago Fortune magazine suggested that it hasn’t been terribly profitable for them. Hold Bitcoin. Square is effectively a custodial wallet. You don’t have control of your private keys and as far as I can tell there is no option for having control of your private keys. Even Coinbase supplies a way to sort of control your private keys via it’s “multisig vault,” so it’s unfortunate to see that Square lacks this option. Provide tax documents. If you sell Bitcoin, you get a 1099. I imagine that this makes things a lot simpler for people who are trying to navigate crypto taxes. Send Bitcoin. You’d think that sending Bitcoin to a wallet would be a basic and necessary feature for any application, but Robinhood’s recent foray into crypto has shown that you can’t take this for granted. Thankfully, Cash App does allow you to send your coins anywhere you please. Inexplicably, however, you cannot send Bitcoin to other Cash App users. Deposit Bitcoin? Nope. Inexplicably this is not a feature — and this is perhaps the most disappointing thing about the Cash App and its relation to Bitcoin. Their site says, “We are working hard to bring support for bitcoin deposits from third party wallets to Cash App” — no mention of when this support might come into existence. I’m very curious about what’s holding Square back here. Are their problems technical, legal, or both? It seems odd to me to try to be a Bitcoin exchange without offering the option of at least some control over private keys, and it seems even odder that it is not possible to send Bitcoin from outside of Square. This means that if I buy Bitcoin on Coinbase or get paid in Bitcoin to a private wallet, I can’t sell those coins on Square. Ridiculous! Square’s relationship with Bitcoin is, at the moment, a little awkward. It seems inevitable that — eventually — one will be able to transact in Bitcoin with all of Square’s various technologies, including their point of sale systems. For the time being, however, they’re essentially just a hobbled Bitcoin exchange. I don’t think Jack Dorsey’s motivations are in the right place, but at the end of the day this kind of mainstream support is good for Bitcoin regardless of the reasons for it. Ultimately my opinion on Square’s relationship with Bitcoin is that we’re going to have to wait and see what features they actually end up implementing. For now, it seems more like a vanity project at best or smoke and mirrors at worst — hype meant to inflate Jack’s ego and perhaps SQ’s share price. Despite this blunt evaluation, I remain hopeful for the future of this company and indeed any company that treats blockchain technology as a technology that will change the world.